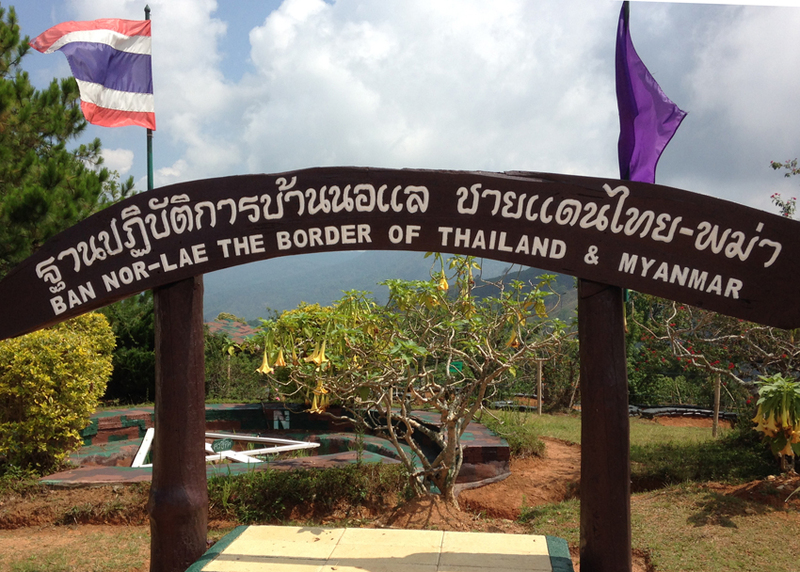 POSTCARD #123: Chiang Mai: We’re on the second day at Doi Ang Khang, not far from the border with Myanmar. Living in a created log cabin structure built on a hill. It’s possible to walk up to the main hotel building because it’s not far but there’s a public vehicle, song-taew that M likes to go on, so we have to call for it every time. M gets on first then I clamber aboard. She laughs: Toong Ting, the whole thing goes down – paloomph – when you get on! Ah well, it’s nice to be noticed… it’s because I‘m heavier than most Thai people. Jiab gets on and the suspension of the vehicle hardly alters. We start going up the hill and at the top get into another vehicle that takes us all around an amazing wild garden titled Suan 80, created by the much revered King of Thailand on his 80th birthday, at the time of writing he is 87. The whole of this area was planned and created by the King and is titled The Royal Project. M runs and skips along the ascending pathways through exotic flowers and fields of vegetables. The simplicity of it. While Toong Ting lumbers along stopping at places where you can sit down, M runs back and asks if I’m okay, then runs off again. I’m struggling with mind states that do more harm than good. Years spent busy with the traffic of thought, intensity, uncertainty and believing simply that this is NORMAL – this stress is how life is supposed to be lived. No instruction, advice, no indicators; it never occurred to me that maybe I should stop pretending I have control over what happens and just let it be… a lifetime of small events that I couldn’t do by myself – it’s simply taken out of my hands. Okay, give up control and I’m carried along in the wave… am I simply selecting the data that fits the theory? Mindfulness of the question is enough for the present time. Otherwise pretty much immersed in thinking about what other people did and failed to do and should have done but didn’t and the true purpose of life is seemingly missing… thus finding my way out from the complex untruth created by those with whom I had placed all my trust. But I’m past that now, can see through it; karma being as it is, it’s not impossible that in some future time there may even be a quality of gratitude for so-called elders’ ignorance (their ignoring). This is the human condition. A small bird appears out of nowhere, lands on a thin tree branch, The tree branch takes its weight, swings low and springs back up – bird folds away its wings, looks around, experiences the swing of the branch. Do trees know the birds are there? Does water know the shoals of fish that swim through it; is the blue sky aware of flying flocks of migratory birds… then the thought arrives: you can only experience something if you’re separate from it. that we should know how to live? Does a tree know how to grow? Does a cloud know how to float? Does the wind know where it is blowing? Does a road know it is going somewhere? “I’m struggling with mind states that do more harm than good. Years spent busy with the traffic of thought, intensity, uncertainty and believing simply that this is NORMAL – this stress is how life is supposed to be lived.” I’m with you…great post. Mooji would ask who is thinking these thoughts and the step back and observation helps detach. Sorry you’re having a bad time! I am so bad I can’t even post. Medication problems. Must get back to Mooji. Mind and person in control. Thank you, and you do the same! God bless! If consciousness is immanent in the universe itself – as opposed to being an emergent phenomena of chemical reactions in your head – where is it perceiving itself as separate? Do birds and trees perceive themselves as separate? Fish and water? Does an ant perceive itself as separate from the colony? Does the colony feel separateness from other colonies or the dirt it digs in? Do our cells have an embryonic sense of being something apart from each other? Do rocks, in some way incomprehensible to us, feel themselves as separate to the earth? Does the earth believe itself to be something other than the galaxy? Does it think we are something different to it? Can a planet have volition? This “thought” that arrives is, I think, a good deal more complex than your statement would imply. I loved your realization here, that we can’t truly experience something while separate from it. It’s a really interesting insight to me, because I think it’s true, but also full of interesting nuance. What does it mean to be separate? I think it means to take a stance in perception that includes drawing an artificial boundary of difference. What is inside of the boundary is “me”. What is outside, is “something else”. But this experiencing also requires that the tree and the Tiramit differentiate from the underlying field of everything/nothing. The mistake we so often make (I think) is believing that this process of differentiating– this movement of all things giving rise to Tiramit and to the tree– has produced two separate and independent things. This is not true, but it seems this way. To see oneself and the tree within the same boundary of identity, while appreciating the experience of differentiation that has taken place, is I think one way of recovering peace even as we occupy a world of seeming differences and difficulties. What does it mean to be separate? There is ‘not-twoness’, non-duality, oneness, and there’s this artificial boundary of difference, as you say. What is inside of the boundary is “me”. What is outside, is “something else”. But this means believing that the process of differentiating has produced two separate and independent things. Spot on quotation from Ajahn Amaro also. Tell me is the title of this post a quote fro Ajahn Amaro I somehow scribbled in my notebook and forgot the source?